Like many bookish people, I’m all about writing things down in my own handwriting and organizing in my own handwriting. Although I love my MacBook Pro, my iPhone, and pretty much any technology, I’m still one who likes to have a nice handwritten planner on me. I’ve been using a Moleskine 18 month planner since it was easy to carry in my bag daily, but I really missed the different sections and pockets and things about my larger Franklin Covey leather planner. I was at a loss. That’s when I discovered filofax! As a part of the flickr group of What’s in Your Bag?, I discovered this nifty little planner that a lot of European people who were members of that group had. I’m all about all things European, so I went on a search for this planner and discovered that I could get them in the U.S. at some bookstores and online. I chose the online way since the closest bookstore that sold them was about an hour away. So, let me tell you about this sweet little discovery. I chose the Personal sized Classic Cherry Filofax. It is the perfect size to fit in all my bags, and it is easy to carry around with me at school. 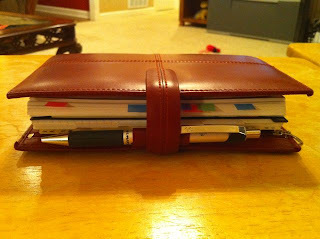 It has all the bells and whistles of a Franklin Covey planner that I love, and a few more. I will apologize in advance for the poor color on the photos. I took them in a hurry and didn’t get the lighting right using my phone. You can see that the planner isn’t too big, nor too little. This is it on top of my 13″ Macbook Pro keyboard. You can also judge the size by looking at the pen I have with it. It is the perfect size to fit in any bag. One thing I love about filofax is that you can purchase an insert that has sticky notes & flags on it so you can flag important dates, times, etc. It costs $8 initially, but I think I can easily refill it with cheaper stuff once it runs out. The flags really help me stay organized and know when something is coming up that I need to be aware of, such as when I’ve scheduled students’ tests or when things are due. 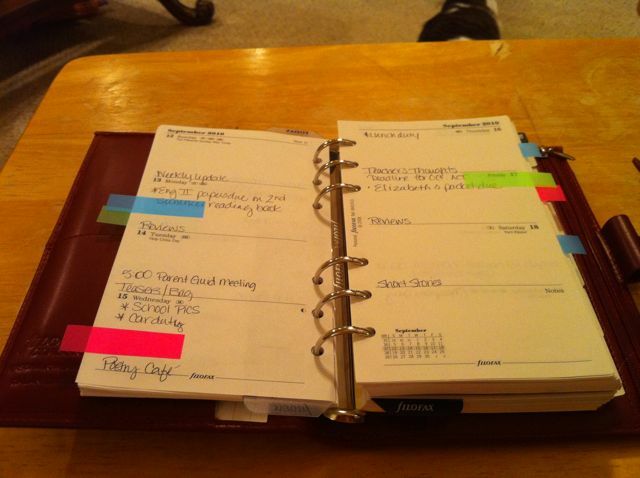 The sticky notes also help me make notes to be able to move from week to week if needed. You can also see the blank tabs behind this pic. 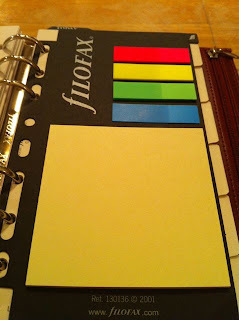 The planner came with tabs filled out, but I wanted to be able to make my own, so I ordered the blank tabs from filofax and I just need to fill them in with a permanent marker. I’m planning on a notes section, to-do section (it came with to-do pages), a lists section, a books section (yay! ), a websites section, and a miscellaneous section. Those seem to be the sections that I will use the most so, hopefully they’ll work. Here’s the last picture with you looking at the planner from the side. It isn’t too thick, nor too thin, and my favorite papermate pen fits perfectly. 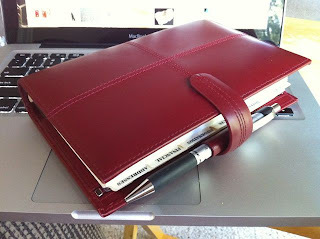 I would have rather had an elastic pen loop, but the planner that I chose only had the leather one. There are lots of planners to choose from, so I may end up getting another one so I can be flexible with which pen I want to bring. All in all, this is a great planner for those of you who want to make sure you stay organized with everything. I still use it and my iCal on my computer and phone. That way I have a constant organizational tool with me. The final verdict on the filofax planner…Four stars (★★★★☆) because there are a few changes I’d make to the planner refills and possibly to the leather planner itself since I’m very partial to my franklin covey unstructured snap binder. But if you want a great quality planner that will go anywhere with you, filofax is the way to go. Previous Post Weekly Update. Yep, I’m still here!